The Etrich Taube , also known by the names of the various manufacturers who build versions of the type, for instance Rumpler Taube, was a pre-World War I monoplane aircraft, and the first mass-produced military plane in Germany. Being the Germans' first practical military plane, the Taube ("dove") was used for all common military aircraft applications, including as a fighter, bomber, surveillance plane and trainer from its first flight in 1910 until the beginning of World War I. The plane was very popular in the years immediately prior to the First World War, and was used by the air forces of Italy, Germany and Austria-Hungary. (Even the Royal Flying Corps operated at least one example in 1912.) By 1914, however, it quickly proved lacking as a serious warplane, and was soon superseded. The plane was developed by Igo Etrich from Austria in 1909, with the first flight in 1910, and was called the Etrich Taube. The design was licensed for serial production by Lohner-Werke in Austria and Edmund Rumpler in Germany, and called the Etrich-Rumpler-Taube  . 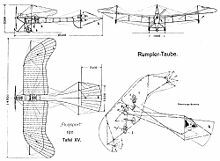 However, Rumpler soon changed the name to Rumpler-Taube, and stopped paying royalties to Etrich. Etrich subsequently abandoned his patent. Despite its name, the Taube's unique wing form was not modeled after that of a bird, but after the Zanonia macrocarpa seeds, which glide to the ground in a slow spin induced by a single wing. Similar wing shapes have also been used by Karl Jatho. While Etrich had tried to build a flying wing aircraft based on the Zanonia wing shape, the more conventional Taube type, with "normal" tail controls was much more successful. At the start, Etrich adopted the format of crosswind-capable main landing gear that Louis Bl�riot had used on his Bl�riot XI cross-channel monoplane for better ground handling, and gained biplane-like strength for the Taube's monoplane wing with a cable cross-braced, orthogonal-layout Brx�cke, or "bridge", beneath each wing panel, which often carried small wire-spoke wheels or skids at its outboard ends, for wingtip protection. Later Taube-type aircraft from other manufacturers would eventually replace the Bl�riot-style crosswind main gear with a simpler V-strut main gear format, and also omitted the underwing "bridge" structure for somewhat better aerodynamic efficiency. Like many contemporary aircraft, especially monoplanes, the Taube used wing warping rather than ailerons for lateral (roll) control, and also warped the rear half of the stabilizer for use as an elevator control surface's function. Only the vertical, twinned triangular rudder surfaces were usually hinged. The design provided for very stable flight, suitable for observation. In addition, the translucent wings made it difficult for ground based observers to detect a Taube at an altitude above 400m. The French called it "the Invisible Aircraft", and it is sometimes also referred to as the "world's first stealth plane". The first hostile engagement was an Italian Taube in 1911 in Libya, using pistols and 2 kg bombs. Taube airplanes were able to detect the advancing Russian army during the Battle of Tannenberg. 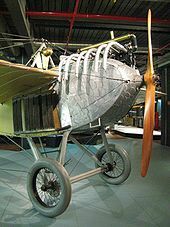 The plane was also used for bombing, when the pilot dropped small bombs in the Balkans in 1911 and 3 kg bomblets and propaganda leaflets over Paris in 1914. 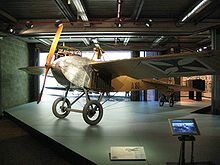 During World War I, Imperial German units stationed at Qingdao, Shandong, China only had one operational airplane, a Rumpler Taube piloted by Lieutenant Gunther Plx�schow facing the attacking Japanese who had a total of eight airplanes. On October 2, 1914, the Rumpler Taube attacked Japanese warships with two small bombs but did not score any hits. On November 7, 1914, shortly before the fall of Qingdao, Lieutenant Plx�schow was ordered to fly top secret documents to Shanghai but was forced to make an emergency landing at Lianyungang where the lieutenant and his Taube were both interned by a local Chinese force. Plx�schow was rescued by local Chinese civilians under the direction of an American missionary, and successfully reached his destination at Shanghai with his top secret documents, after he gave the engine to one of the Chinese civilians who rescued him and burnt the engine-less aircraft. Poor rudder and lateral control made this plane difficult and slow to turn. Consequently the plane was a very easy target for the faster and more mobile enemy planes at the beginning of World War I. Therefore, six months into the war, the Taube was removed from the front lines and instead used to train new pilots. 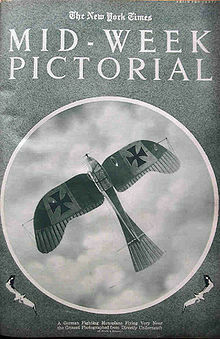 Consequently many famous pilots learned how to fly using a Taube. Due to the lack of license fees, a total of no less than 14 companies built a large number of variations of the initial design, making it difficult for historians to determine the exact manufacturer based on historical photographs. An incomplete list is shown below. The most common version was the Rumpler Taube with two seats. Biplane version produced by the Albatros Flugzeugwerke. Version with a steel frame. Produced by the inventor Igo Etrich. Initial name of the "Rumpler Taube". Produced by the Reise- und Industrieflug GmbH (RFG). Produced by Edmund Rumpler, Luftfahrzeugbau. Version with a closed cabin, produced by Edmund Rumpler, Luftfahrzeugbau. Two units were ordered by Chinese revolutionaries to fight Imperial Qing China, but when the they reached Shanghai in December, 1911 with other Taube airplanes ordered by Imperial German forces stationed in China, the Imperial Qing dynasty had already been overthrown and the airplanes did not have the opportunity to participate in the battle. The Technisches Museum Wien is thought to have the only known remaining Etrich-built example of the Taube in existence, an early enough example to have a four-cylinder engine powering it. 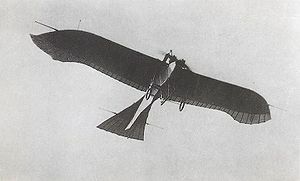 Other examples of original Taubes exist, such as one in Norway, which was the last original Taube to fly under its own power in 1922, over a Norwegian fjord. The Owl's Head Transportation Museum in Owls Head, Maine USA, is so far the only known museum to attempt the construction of a flyable reproduction of the Etrich Taube in North America. Their example first flew in 1990, and it still flies today with the power of a 200 hp Ranger L-440 inline-6 "uprighted" air-cooled engine. 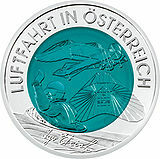 The Rumpler Taube has recently been selected as a main motif for a euro collectors' coin, the Austrian Aviation commemorative coin, minted on February 28, 2007. This reverse side of the coin shows the Rumpler Taube as well as the “Zanonia” glider and a waving Igo Etrich sitting in the open cockpit of a plane. Etrich Taube Pictures and Etrich Taube for Sale.